A sign which says ‘Ancient Church’ is irresistible to me. You never know what you might find off the beaten track, and sometimes the most beautiful places are the most hidden. On holiday in Devon, I followed one such sign, near the National Trust property Arlington Court in Parracombe, to look at the Church of St Petrock. 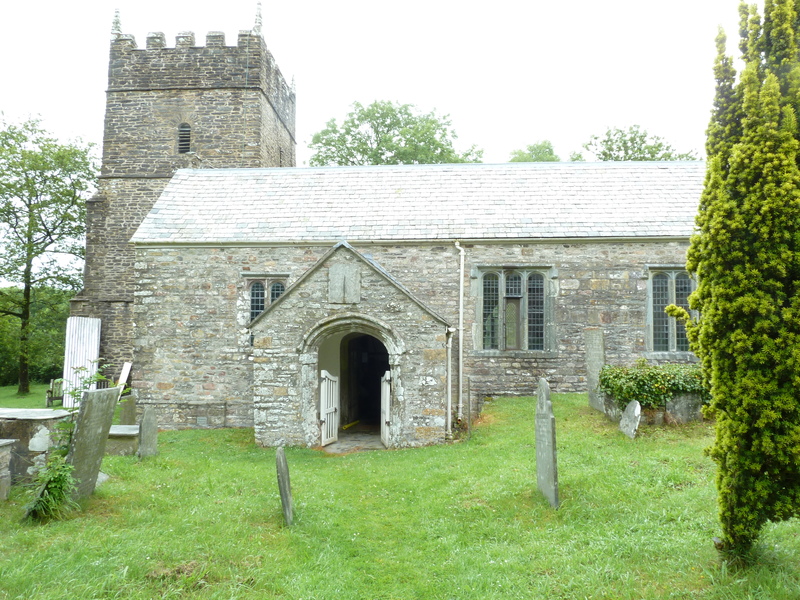 Like a number of other churches in Devon and Cornwall, this one takes its name from the Cornish saint, a prince originally from Wales who is reported to have performed many miracles. The church is in a beautiful position with views overlooking the hills and valleys of the land, and with an old churchyard which I explored with my son (who is also partial to a nice graveyard). The church is reputed to have been built by William de Falaise in the eleventh century (he was a relative of William the Conqueror), though with later additions. In its secluded spot the church retains an atmosphere of the ancient, with much of it both inside and out being fairly plain. 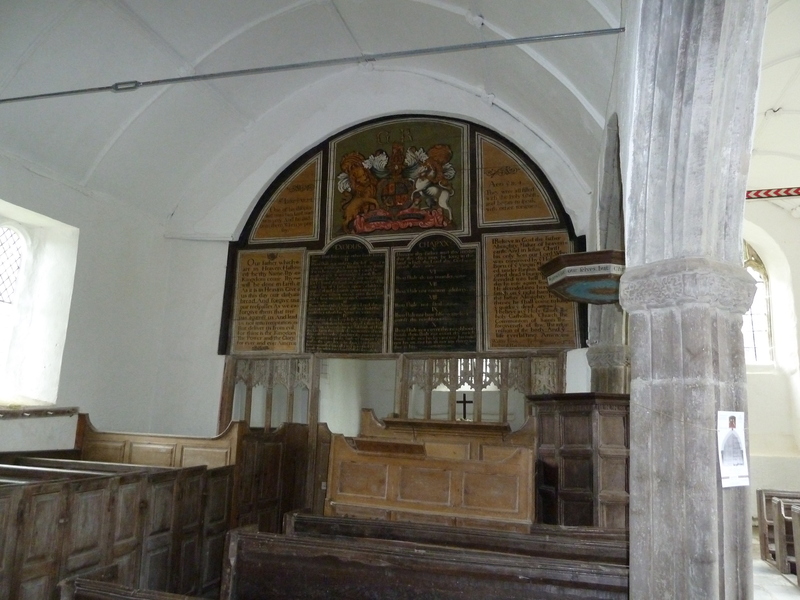 There is a wonderful painted screen, however, depicting the Ten Commandments, the Lord’s Prayer and the Apostles Creed alongside the Hanoverian royal arms. The guidebook tells me that the interior has not been altered in any way for two hundred years, and thus ‘shows the fashion in church furnishing that prevailed in a simple village church in the late eighteenth century’, complete with high box pews for keeping out the drafts, and plain sixteenth century benches. There is something refreshingly simple about it, as though plainly dressed, devout rural worshippers might solemnly file in at any moment. Fascinatingly, two old cottages nearby represent what is left of the church ale house, which brewed refreshments for the congregation. And as a final touch to bring the scene to life, it seems that ‘one pew has a piece cut out to allow room for the bow of a bass viol. St Petrock’s is believed to have been the last church in Devon in which the singing was accompanied by a band of musicians.’ The church was nearly pulled down in 1879, but John Ruskin defended it and offered a donation for a new church to be built elsewhere. Though the church is no longer in use, now looked after by the Churches Conservation Trust, it still somehow contains echoes of faith, and is, perhaps surprisingly (or perhaps not) one of the most visited churches in the country. 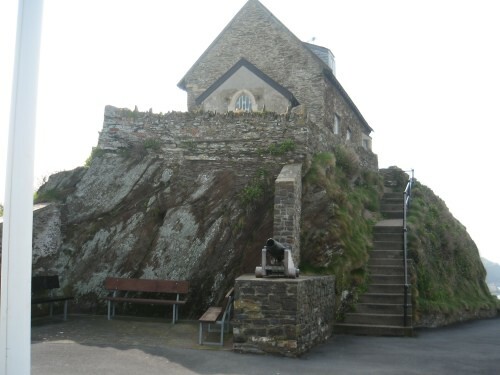 The chapel I visited was St Nicholas Chapel in Ilfracombe, on a hill above the harbour. Overlooking Damien Hirst’s ‘gigantic and arrestingly hideous Verity‘ (according to the Guardian, and I can’t say I like the sculpture either), there is something of deep peace about the little chapel overlooking the sea, beset – on the day I visited – by high wind and heavy rain. Built in 1321, it has also served as a lighthouse for much of its life (and is still a working lighthouse) – a nice metaphor for its early purpose as a beacon of hope for workers in the harbour. With the dissolution of the monasteries it was no longer a chapel, and has been used as a reading room and a laundry, and in the mid-nineteenth century was home to a lighthouse keeper and his fourteen children. Now maintained by the Rotary Club, it contains a few pieces of furniture which recall this domestic dwelling, though services are still occasionally held at the tiny altar. It’s a steep climb, but a tiny gem. 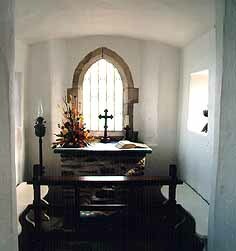 The half mentioned in the title refers to the ruins of St Michael’s chapel in Braunton. 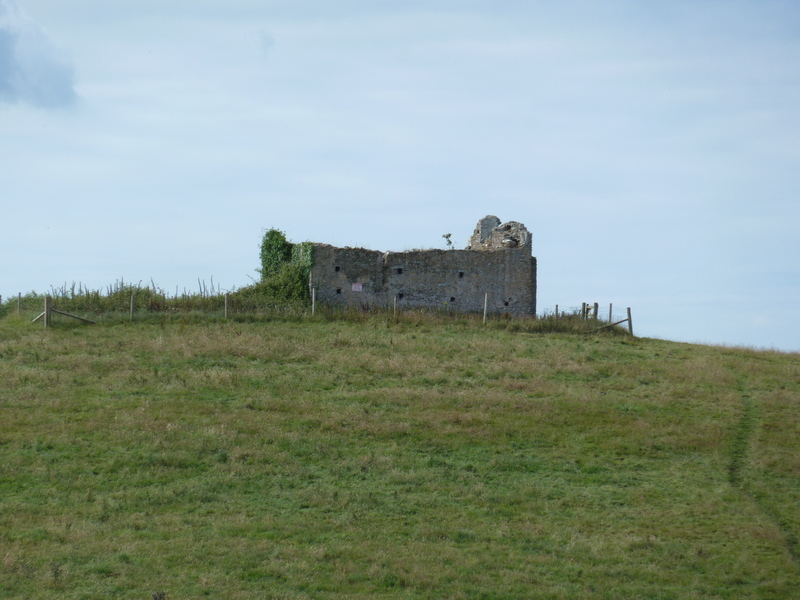 This is a sixteenth century chapel high up on a hill, which we could see from our holiday home, and I spent the first few days here planning a trip to explore it. Its position made it a perfect place to watch the seas and pray for sailors. Legend has it that the church was demolished every night by the devil, so eventually it was abandoned and the church of St Brannock was built in a more accessible spot in the village. We tried very hard, climbing several steep hills with a three year old, but ultimately were defeated by padlocked gates and electric fences, so although we saw some lovely views we never got to the chapel.